The group is an Affiliated group of the Western Chan Fellowship, in the lineage of Chan Master Sheng Yen. Chan Master Sheng-yen died on 3rd February 2009 in Taiwan aged 80. Following the removal of one kidney in 2005 and subsequent weekly dialysis, his health was fragile yet he continued to give lectures and attend many public events. In December he returned to hospital and prayer vigils were held. He was well enough to leave hospital and attend the End of Year Charity event, however his health then deteriorated further and he was unable to attend Chinese New Year celebrations. Thus ends the life of one of the most influential and deeply thinking Zen masters of our age. In 1975, Master Sheng-yen received transmission from Chan Master Tung-chu of the Ts‘ao-tung ( jp. Soto ) lineage tradition of Chan. In 1978, he received transmission from Master Ling-yuan of the Lin-chi ( jp. Rinzai ) tradition of Chan, becoming the 2nd generation descendent of Chan Master Hsu-yun, the greatest contemporary patriarch and reviver of Chan Buddhism. Those of us in the West who were fortunate to train with him, both here in the UK and during other Chan retreats he lead throughout Europe and in New York, will remember him with profoundest gratitude and love. Ceremonies of remembrance and gratitude were conducted at Dharma Drum Mountain in Taiwan and around the globe. On 5th February his body was cremated and after a further 14 days of ceremonies of recitation, there was a simple, non-religious burial of the ashes. Our Sangha exists by virtue of Shifu's transmission to John Crook and later to Simon Child. Each of us in the Western Chan Fellowship is indebted to Master Sheng Yen's Teaching on the Bodhisattva Way and to him as the most devoted exemplar of the Dharma. A small group of Fellows were extremely fortunate to travel June 2008 on Pilgrimage to monasteries and temples in mainland China and to visit DDM in Taiwan. We were blessed with an hour's audience with Shifu during which he answered questions and gave Refuge, Precepts and Vows in a simple, private Dharma naming ceremony. We will miss him and offer our deepest thanks for his life and teaching. Meeting bi-monthly each 1st and 3rd Monday Evening, 7.30pm - 9.30pm. The evening ususally includes 2 periods of sitting meditation - ‘Mo - zhao’ or Silent Illumination and a period of walking meditation - ‘Kin-hin’. We recite a the Chan Buddhist Liturgy of Heart Sutra, Refuge and Vows in both English and Chinese. The meditation evening is offered freely and dana is welcome. Newcomers are welcome and are asked to please telephone me or contact me via email for any further information and to check on current meeting dates as we are a small group and flexible as to the strict regularity of the meetings. Occasional Day Retreats offered with visiting Teachers, either senior Fellows of the WCF or from other lineages. We held a very simple ceremony of thanksgiving and reflection. Dr John Crook, our Teacher, was most beloved and will be missed by so many in this country and around the world. A tremendous innovator in bringing Chan to western minds and lives; in opening the path of investigation –’ t’san’ – through working with koans and the hua t’ou; in conveying the practice of Silent Illumination in the lineage revived by Shifu – John brought unfailing inspiration and insight together with deep patience and warmth of heart. 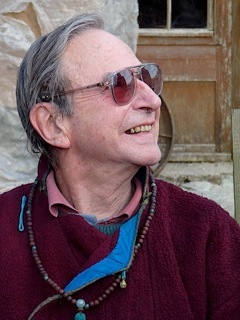 1st western Dharma heir to Master Sheng yen and Teacher of the Western Chan Fellowship, John led retreats in his centre in Wales for 35+ years and over the last decade in Europe and the U.S. Completing a circle, he gave a Dharma talk to a large group of Taiwanese monastic students at Dharma Drum Mountain in 2008, bringing a western thread back to its Chinese origin and inspiring a host of young Chinese minds. His founding of the WCF built a bridge between contemporary European and contemporary Chinese Zen and the benefits of this 2 way relationship continue to ripple, discreetly yet with significance in these times. John's essential joy, in Dharma and in life, infused his work. Whether writing or speaking, his enthusiasm and sharp inquiry flowed forth in profusion for many decades. We are blessed to have been connected though John to this unbroken tradition and to its spirit, embodied as it was, though John’s brightness and pure freedom of mind, his ready humour and utmost kindness of heart. Fiona Nuttall, Zhi-jing Fa-hong, is the first Dharma Heir of Simon Child. Fiona trained with Chan Master John Crook and Simon Child from the 1990’s and is Chair of the WCF committee. She has been leading retreats for the WCF since 2007. Fiona received Dharma Transmission on 1st November 2015, receiving the Dharma Name 智淨法宏 Zhi-jing Fa-hong, Wisdom Pure Dharma Greatness. This retreat is residential with accommodation and food provided. The cost of the retreat is £130 with some bursaries available on application. For further information, please contact Sophie Muir 01326 221651. See also the Gear Mill web site.